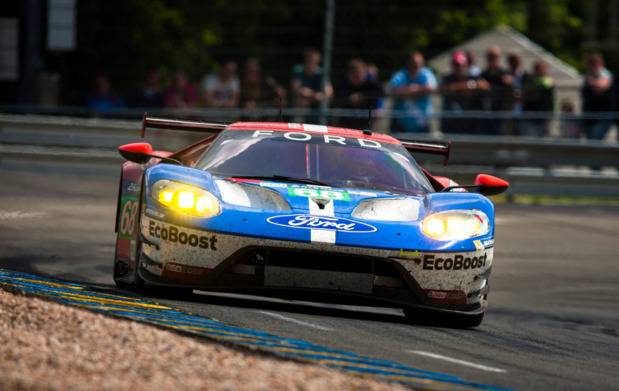 Screenshot via Ford PerformanceVictory at Le Mans. It was 50 years ago to the day that Ford finished 1-2-3 at the 24 Hours of Le Mans in France. The 1966 victory has gone down in history, but on Sunday, Ford came close to repeating that feat. The circumstances were slightly different, but the result was almost the same. In the GTE Pro racing class, two notches below the top prototype class, an all-new Ford GT outlasted a staunch challenge from Ferrari, also running an all-new 488 car. Driver Dirk Müller competed 34o laps in the 84th running of the world’s most famous endurance race to take the victory. He and teammates Joey Hand and Sébastien Bourdais kept the number 68 Ford GT ahead of the number 82 Risi Competizione Ferrari 488 and Giancarlo Fisichella, who was at the wheel for the final hours of racing. The number 68 Ford also captured the pole position in qualifying, with Müller notching the fastest time. It was a pole-to-pole finish for Ford, although there were periods during the race, especially overnight, when Ford ran second to the Ferrari. However, the GTs looked to be the cars to beat at Le Mans this year, based on qualifying results. If not for Risi Competizione’s efforts, Ford might have repeated the 1966 result; as it was, the team finished 1-3-4, with a fourth car that endured mechanical problems during the rain-soaked start on Saturday falling many laps behind but completing the race in 9th place in its class. Porsche was the overall winner in the top prototype class, LMP1-H, where 1,000-horsepower cars turn much faster laps than the GTE Pro entrants, which are based on road cars. Porsche captured the win when the lead Toyota stalled in the pits on its final lap. The win for Ford caps a campaign that began at the Detroit auto show in January of 2015 when the GT supercar was revealed. Ford then announced that it would return to Le Mans after an absence of decades to celebrate the epic trifecta in 1966. Now as then, Ford dueled Ferrari. But in 1966, it was a grudge match, as Henry Ford II wanted to beat Enzo Ferrari in the Italian’s back yard after the Ferrari founder balked at a Ford buyout. For Ford, the win represents the peak of its racing series thus far, which has taken place in North America and Europe. The four cars came together at Le Mans for their run at history. And in the end, the team and its Chip Ganassi Racing drivers nearly duplicated a legendary Le Mans result. The top two Ford teams were joined by Ford Chairman Bill Ford on the podium as “The Star Spangled Banner” was played by a band and rang out across the southwestern French countryside.